Remember how busy last Saturday was for me? It was a crazy morning filled with broccoli blanching and valentine pancake making, then basketball gaming the rest of the day. This is why cooking dinner when I got home at 6:45 didn’t sound fun. Plus, you should (not) have seen how messy my kitchen was after the morning insanity when I was running late to serve concessions at the games, so I had to decide between washing dishes and getting dressed in actual clothes that weren’t pajama pants. I chose the latter. Everyone was grateful. But this choice meant that I came home to an exploded kitchen. If ever there was an excuse to want frozen pizza, this one was it. We all have those times, right? We talked about this just last week. Some of you mentioned wishing you knew how to make your own frozen pizza, then others chimed in about how to do it, and since this has been on my list to tell you about anyway – I decided there was no better time. So frozen pizza everyone: You can make them yourself. With real ingredients and whole foods, keeping your very own people and their preferences in mind. With little effort. And all the mothers everywhere shed a tear. 1. Mix up your favorite pizza dough. I suggest this very easy Whole Wheat Pizza Crust recipe. I also suggest doubling or tripling or octupling (I was going for 8x there, how’d I do?) the recipe. It just makes sense to create only one mess in order to make several meals worth of pizza for your freezer. 2. 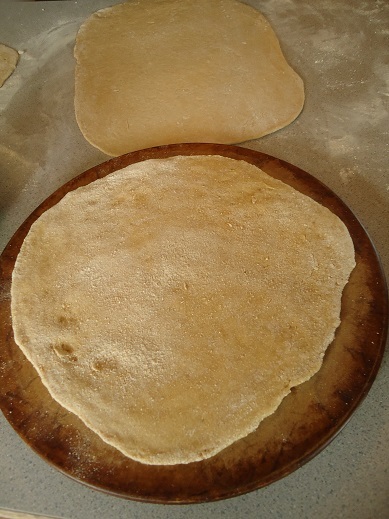 Roll out the dough to your desired sizes, thickness, and shapes. Make personal sized crusts, make rectangle crusts to fit your pans, make circle crusts to fit your pans. Make whatever works best for your freezer, your oven, and your family. Life is too short to roll dough perfectly. 3. Bake each crust in a 375° oven for 5 minutes (assuming you are using this crust recipe), then remove them from the oven. They will be only lightly baked at this point – just done enough to be perfect for preparing your pizza for the freezer. 4. 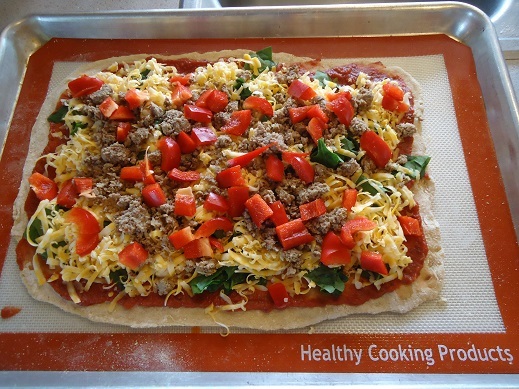 Top each pizza crust with toppings of your choice – any sauce, meats, cheeses, and veggies you like. Make a variety to suit your family’s preferences. I topped this one with sauce, spinach, colby jack cheese, hamburger meat, and red peppers. We are still loving our silicone mats from Healthy Cooking Products! 6. When you are ready to bake your frozen pizza, thaw it if you wish. Otherwise, just take it directly from the freezer, unwrap it, and put it on your baking pan. Bake in a 375° oven for 10-18 minutes or until the cheese is melty and perfect. Aren’t you excited about how easy this is, about how much time this will save you, and how fun this will be to serve to your family?! It will be effortless to pull out some mixed greens and fruit to go with your pizza – so your meal prep on a homemade frozen pizza night will be nil! I highly recommend making several pizzas for your freezer in one setting. If you’re going to mix up crust and make a little mess rolling it out, if you’re going to grate cheese, if you’re going to chop veggies, if you’re going to cook meat – you really might as well just hit it hard and get several pizzas stacked up in your freezer if you have the space. In addition, consider prepping pizza ahead of time for a busy day and just keeping it in your fridge to bake at dinner time. 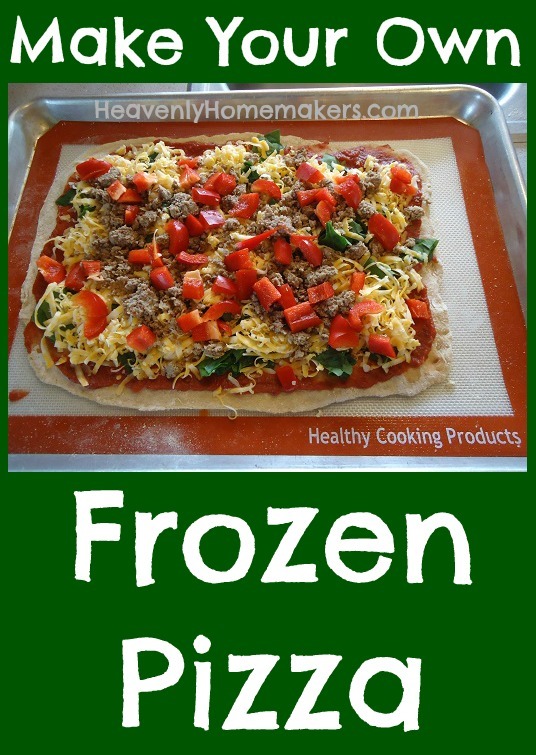 Ever tried making homemade frozen pizza? How excited are you to try this idea?! Question: Isn’t the crust to flimsy to hold the toppings while you wrap it and get it into the freezer? Don’t you need a cardboard circle or something underneath? I LOVE this idea, but I’m missing something here. Once it pre-cooks in the oven for 4-5 minutes, it’s stiff enough to be able transport and not flop with toppings on it. I let mine cool a few min on a cooling rack, then I transfer to a clean (!!) kitchen trash bag and then top it with toppings. Once it’s finished, I close the trash bag around the pizza and clip it with a kitchen clip, and freeze it in trash bags! Also, our favorite way to cook pizza is to grill it! 8-12 min per pizza…side burners on and middle element off after preheating all 3 on medium (if you have a 3-element grill). Crust is never soggy in the middle and tastes amazing the next day for leftovers too (just grill on low til melted to RE-heat). Thank you for your whole wheat crust recipe, Laura. I use it all the time! I do love homemade frozen pizza! I haven’t made it in awhile, but I am prepping a list of freezer meals to make for when our baby is born. :) This is going on the list! I am going to try and find the two-gallon bags! I always reuse them unless they had raw meat . . . Thanks for the great idea! Hi Laura. Do you have any idea why when I went to ‘Print Friendly’, it came out in French and would not allow me to translate it??? A mystery indeed…. Ooohhh yay thank you!! Perfect. We love the pepperoni recipe you have linked on your site. I just let it sit all day in the fridge then brown it – so yummy. We prefer to just freeze prebaked crusts. I alwYs have cheese and sauce in the freezr and it takes 30 min for my pizza stone to get fully hot so its plenty of time to prep a crust. I love your ideas to take trouble make 4 at a time and freeze them special when we will be working in the garden pretty soon and it save time and also we can rest after the day’s work. Thanks for the ideas As I never eat in a hotel or outside this suggestion is great for me because I like home cook food. Hi Laura. Thanks! I also set the oven on broil for 3-5 minutes if the cheese isn’t so brown. Thanks, as always, for another great make-ahead recipe idea! I regularly freeze pizza crusts, although our favorite when possible is to grill the homemade crusts. They keep that grilled flavor even after being frozen, so it really is a treat. For some reason, though, I’ve never thought to create and freeze a whole pizza. I may try it. It will depend on how full my freezer is (sometimes it would be tight to store a whole pizza). Also, as was mentioned, sauce, cheese and turkey pepperoni are usually staples in my home, so it’s still a quick meal with just the pre-made crusts. But, as we speak, today I am out of mozzarella cheese and pepperoni, and there are days when even half the work is still too much…..so I will definitely try it! I usually use a whole wheat pizza crust recipe made in my bread maker, but it requires more time to rise, so I also look forward to trying your quick recipe. Thanks!